Présentation en anglais Dinner with a top French chef is an impossible offer to refuse ; the chance to follow one into his kitchen and to run away with his recipes is a food-lover's dream. Here, fourteen world-renowned chefs divulge the secrets of their favorite recipes-from roasted, stuffed partridge with chestnut polenta to sea-anemone fritters, and from crème brûlée with warm chocolate cake to pistachio macaroons. 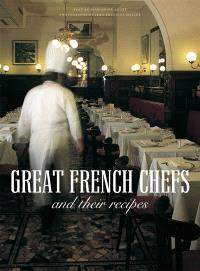 Insider biographies of the men and women behind these great dishes, mouth-watering portraits of the featured recipes, and candid photographs of the chefs at work allow us to savor the diverse regional flavors and passionate creativity that make French cooking the ultimate culinary benchmark. Mousseline of red peppers with herbs and deep-fried prawns, classic French fries with sea salt, peaches in caramelized pastry, and tangerine soufflé... Cooking in the hands of these French masters is truly an art form, a creative process that is as much about the personality of the chef, his passions, and regional influences, as his ingredients. The great French chefs here range from the exponent of traditional French home cooking to the avant-garde master, from the media celebrity to the Michelin-starred genius. Together they bring us the very best of fine French cooking, and indeed, a taste of France.